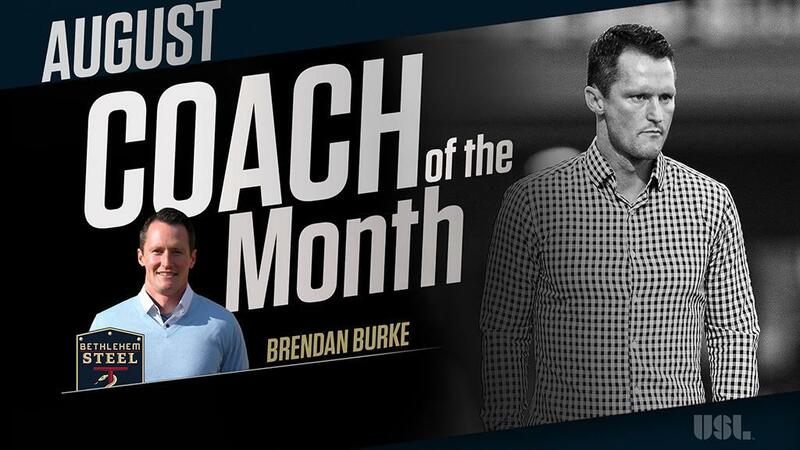 TAMPA, Fla. – Bethlehem Steel FC’s Brendan Burke has been voted the USL Coach of the Month for August, having led Steel FC to victory in five of its six outings – including four victories on the road – as Bethlehem drove up the standings and into the playoff positions in the Eastern Conference. Burke received 50 percent of the poll to claim the award ahead of OKC Energy FC’s Steve Cooke, who finished with 17 percent, and FC Cincinnati’s Alan Koch on 13 percent. Cooke led Energy FC to four consecutive victories to close the month of August to rekindle the club’s hopes of a fourth consecutive USL Cup Playoffs berth, while Koch’s FC Cincinnati maintained its undefeated streak throughout August to take a commanding league in the Eastern Conference. Burke has led Steel FC since the club’s inaugural season in 2015, having previously had a standout coaching career in the Premier Development League with Reading United AC while also serving as an assistant coach for the Philadelphia Union. Burke led Bethlehem to its first USL Cup Playoffs berth a season ago, and currently has the side in sixth place in the Eastern Conference standings with five weeks to go in the 2018 regular season.